Are you on Google+? 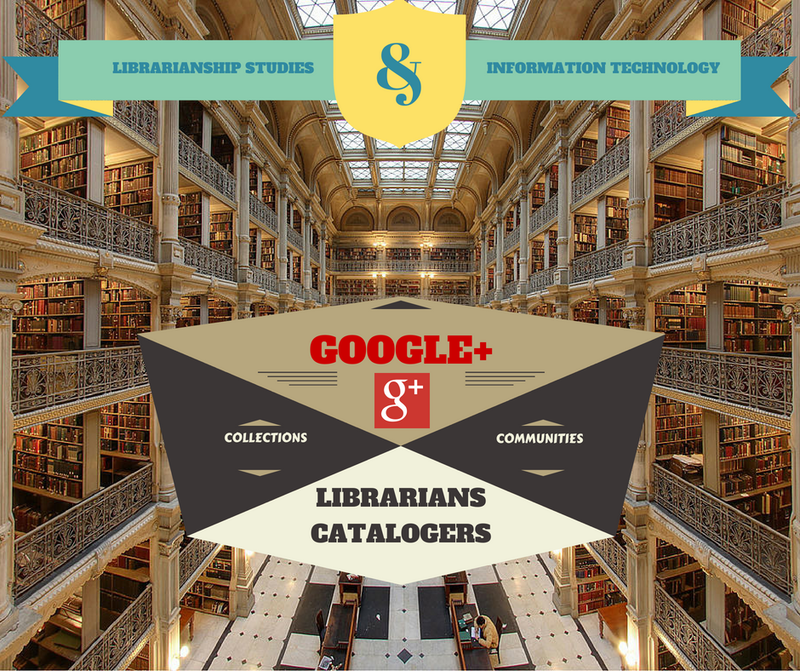 Do you know all of the Google+ Collections that you can follow and Google+ Communities that you can join for latest updates on Library and Information Science and Library Cataloging? 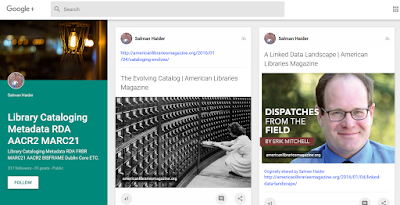 Even if you are not on Google+ this article will present a compelling case for you to join Google+ to be updated of latest happenings in the fields of Library and Information Science and Library Cataloging. Google+ Collections - In May 2015, Google+ launched “Collections” feature which was inspired by Pinterest. It allows users to "build content collections based on topics and interests". Google+ Collections allows you to categorize your updates by topic, which helps your followers quickly find updates on the topics they’re interested in. Google+ Collections allows users to start categorizing their posts, photos, and videos by topic. Collections differ from Pages or Communities, in that you are the only person modifying the content, and the posts will appear in your profile stream for followers. This feature is currently available for the Web, Android, and iOS. It may be the biggest release on Google+ for the past two years or so. And for many, it is putting to rest that Google is sitting on its laurels when it comes to social. Google+ Communities - are groups created on a specific subject that can be anything from gadgets to science fiction. An individual or a business can create a Google+ community around any subject of their choosing to engage other users on the network with an interest in that subject. As a result, communities can create a direct connection with your target audience, helping them join the discussion. Released December 6, 2012, Google+ Communities allow users to create ongoing conversations about particular topics. Google+ Communities can also be created and managed under Google+ Page accounts. G+ Communities are places where users can share specific questions, comments or content relating to a particular topic with other users who are just as interested in the conversation. For example, if you're a member of a librarian community, it's likely each post will contain something related to librarianship. In a recent controversial article in the Wall Street Journal In Age of Google, Librarians Get Shelved, Steve Barker writes “The next time you visit a public library and see an older person at the information desk, someone near retirement age, take a good look. You may be seeing the last of a dying breed, the professional librarian.” This was countered by an article in American Libraries Magazine titled Librarians in the Digital Age : A response to the Wall Street Journal column by Sari Feldman and Julie Todaro where they responded “… … At a time of information overload and growing gaps between digital “haves” and “have-nots,” the roles for dynamic and engaged librarians are growing. Though their skills and the technologies they use may be changing, they have never been more valuable to people of all ages, socioeconomic, and educational backgrounds.” So it is for sure that the libraries and librarians are here to stay by they need to upgrade their skills and be more updated on the technology front. Librarians are required more than ever to be updated on new happenings in the field of Library and Information Science and Information Technology. Google+ Collections and Communities offer useful means to get updated for the latest information on Library and Information Science. We have compiled a list of some of the top Collections and Communities on Google Plus on different areas of Library and Information Science, Librarianship Studies and Information Technology, and Library Cataloging. RDA Cataloging (658 Members) : RDA Cataloging is an online community/group/forum for library and information science students, professionals and cataloging & metadata librarians. It is a place where people can get together to share ideas, trade tips and tricks, share resources, get the latest news, and learn about Resource Description and Access (RDA), a new cataloging standard to replace AACR2, and other issues related to cataloging and metadata. Libraries and Librarians (8349 Members) : This is a public community about libraries and librarians of all kinds, covering both local and global issues in librarianship. 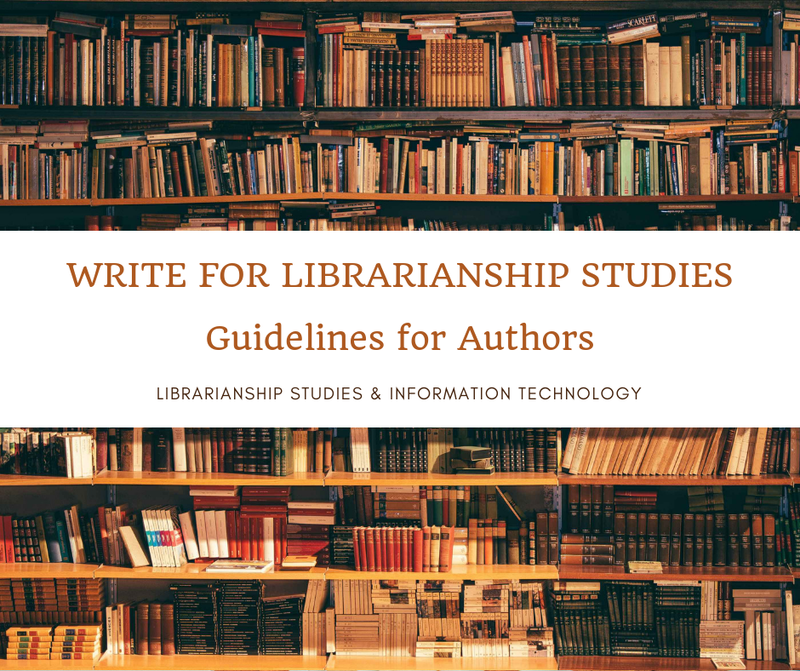 Librarianship Studies & Information Technology (36 Members) : Librarianship Studies & Information Technology is an online community/group/forum for library and information science students, professionals and cataloging & metadata librarians. It is a place where people can get together to share ideas, trade tips and tricks, share resources, get the latest news, and learn about library and information science and information technology. This community is associated with (though not limited to) Librarianship Studies & Information Technology Blog. I strongly urge all the librarians and catalogers to join this G+ community as gradually more and more information will appear on this blog and this community will serve as a great platform to discuss issues related to Library and Information Science. Code4Lib (751 Members) : Code4Lib isn't entirely about code or libraries. It is a volunteer-driven collective of hackers, designers, architects, curators, catalogers, artists and instigators from around the world, who largely work for and with libraries, archives, and museums on technology "stuff." It started in the fall of 2003 as a mailing list when a group of library programmers decided to create an overarching community agnostic towards any particular language or technology. Library Marketing & Visual Communications (365 Members) : This community is designed to share and discuss visual communications methods and ideas for the promotion of library services and events. 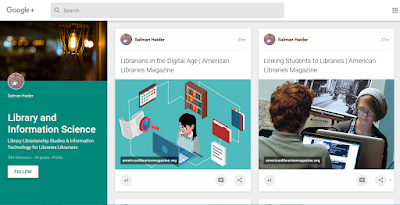 Library Technology (414 Members) : A Google+ community to discuss all things library tech. Discovery & access. Databases, e-journals, ebooks. Web, mobile, local apps. Digitization, born digital, digital archives. Social media & web publishing. Online instruction & reference. School Library Media Specialists (1954 Members) : A community for school librarians, media specialists, teacher-librarians, or anybody who deals with tech, media, and education. Please suggest additional Google Plus Collections and Communities to be included in this list in the comments section of this article. Suggest only active G+ collections and communities with a significant number of followers or members. This article will be updated yearly listing major active Google Plus Collections and Communities in the field of Library and Information Science and Library Cataloging which have a significant number of followers and members. If you are seeing this on a mobile device and if the infographic is not visible then switch to web version. This multimedia article Google Plus Collections & Communities for Librarians & Catalogers is widely discussed, appreciated, cited, referred, and hyperlinked. Some places where it is discussed and referred are given below.